Have your kids Enjoy a Thrilling experience under the sea, with the Crab cake play pen. 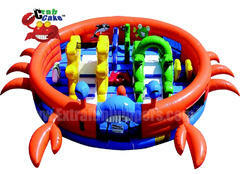 This unit features Fishes, reefs, Starfish and much more. Let's not forget 2 slides for extra Excitement for your love ones. (WE CANNOT TAKE THIS UNIT UP OR DOWN ANY STAIR OR HILLS, THE PATH TO THE SETUP AREA MUST BE FLAT AND THE ENTRANCE TO THE SETUP AREA MUST BE AT LEAST 3 1/2 FT WIDE). Customer Needs 1 Seperate outlets for this inflatable.